Improving listening skills is possibly the most beneficial commitment one can undertake. The importance of listening can be neither overstated, nor overrated. Everybody profits from an encounter with an excellent listener. An excellent listener though, profits from every encounter. One activity that will put you far out in front is to continuously develop the skill of listening. Genuine listening is rare. So few practice it. When we listen we learn. When we learn, we gain knowledge. When we gain knowledge we are in a position to apply that knowledge to action that produces beneficial outcomes to all involved. 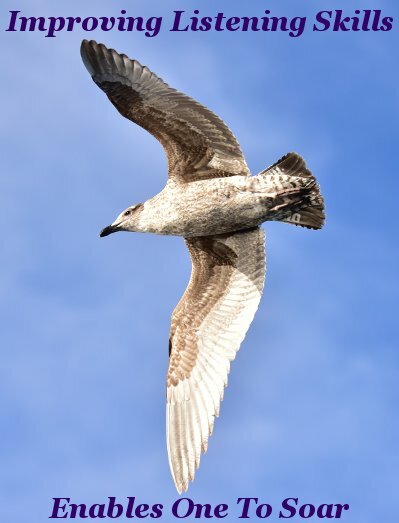 Improving listening skills enables one to see the big picture from a height unattainable any other way. First and foremost - improving listening skills necessitates that one wants to listen. Wanting to listen to another when we believe the subject under discussion is of no interest to us, or we simply do not want to hear the message, is a desire that largely has to be encouraged by oneself, for oneself. As difficult as this can be, once attained, one’s mindset is changed and expanded for the better. We see situations in a new, clearer, light, recognizing another Human being who is seeking our attention. To hasten the process of creating, and then maintaining, a desire to listen, a most useful axiom is . . .
Recalling this legendary counsel has helped many to avoid much unnecessary strife. Visualizing oneself as a self reliant peacemaker and can-do problem solver, smooths what can be an initially bumpy path. Listening is not always easy, nonetheless, when we do, the rewards follow. The purpose of listening is to comprehend and understand. Understanding another’s point of view, to their satisfaction, is the prime concern. Whether or not one agrees with the other party is irrelevant at this point. Ditto for fact or fiction and right or wrong. At this stage establishing rapport is all important. These other matters can be dealt with, much more readily, and effectively, once rapport is on a firm footing. Establishing and maintaining rapport lays the foundation of a relationship within which can be found equitable solutions to any problem. Equitable solutions are the only solutions that can stand the test of time. If listening is limited or nonexistent, so too is rapport. Attentive listening creates goodwill and leads to the rapport that holds the power to alleviate and ameliorate the consequences of past – and present - transgressions. Improving listening skills and contributing to the Joy of the World is the vested right of every man woman and child. As is the manner he or she executes this fundamental Human right. 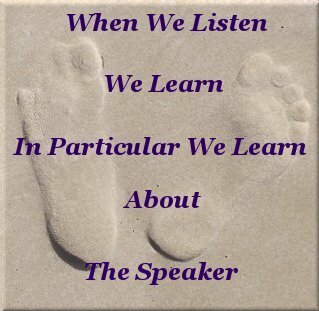 Improving listening skills by learning and applying the fundamentals of listening places one in a position of considerable power - and responsibility. A genuine listener asks questions. Whoever is asking questions is in charge of any interchange between one or more people. This power is not the viciously abusive practice that has caused the chaos, misery, and destruction that we are aware of since recorded History. Nor is it the control of our fellows. Control is the sick desire of the individuals who are the architects of such chaos. Destructive behavior requires no skills. Listening has many purposes. The predominant types of listening allow us to fine-tune our response to suit the situation or occasion. Improving listening skills requires one to be cognizant of each type and display a readiness to adapt to a particular type, or combination of types. Indeed - reenacting an actual scene in one’s imagination can prove invaluable - With the proviso that one is practicing reaching an equitable solution, as opposed to justifying a self serving stance to one’s conscious mind. As with most things in life, there are a gazillion ways to do a thing wrong, and a limited number of ways to do something right. In this respect the art of listening suffers from the usual malady of misapprehension. Listening seems not to have the status of talking. Being relegated to the lower position relative to speaking, tends to foster and justify this misapprehension. Engendering the first two types of listener. All the same, despite this misapprehension . . .
Genuine listeners stand out – So too do non listeners. Genuine listeners are sought out. Not so non listeners. For a relationship to work there has to be a meeting of the participants minds - this necessarily involves listening. 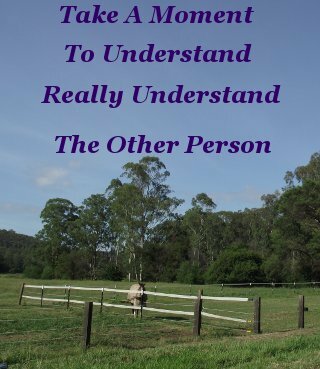 Being prepared to truly listen with the intention to understand another, has a salutary effect on one’s psyche. Others sense this effect and are attracted to it even though they may be at a loss to identify it. People will confide in you, and this works towards strengthening relationships. A good listener does not gossip, belittle or put others down, or reveal confidences. A good listener is a vault of security for all who come into contact with him or her. The hallmark of a genuine listener is he or she listens without considering the common attitude of ‘what’s in it for me’. A disinterested listener is a welcome asset to any relationship, team, or situation. It has struck me over time that the people who genuinely listen are usually competent at whatever they do. They are not afraid to ask questions, or admit to being wrong, and they don't take offense. Sincere Humans who consistently focus on improving their listening skills, are strong Humans indeed.